iMessages is commonly used by iPad users for it is convenient to send free messages via Wi-Fi or cellular data connection. However, you may accidentally delete your iMessages, or get iPad lost or stolen, or a failed jailbreak, iOS upgrade, human error, device crash. Any of them will put you at great panic. In this case, what can you do to recover lost or deleted iMesages on iPad? 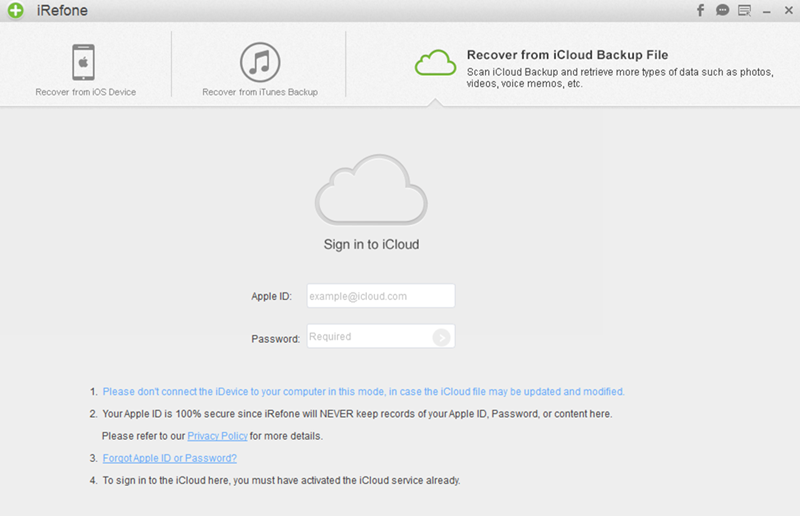 The common way people use to get back iPhone data are using iTunes and iCloud - You can restore iPhone/iPad from the latest iTunes/iCloud backup. However, this method is useless if you have no backup. And it is not suitable for retrieving specific items on iPhone/iPad, because iOS device will be erased after restoring - the data on your device will be completely replaced by the backup. So if you want to recover only iMessages on your iPad and don't want your other data on iPad to be erased, you'd better choose another suitable method. 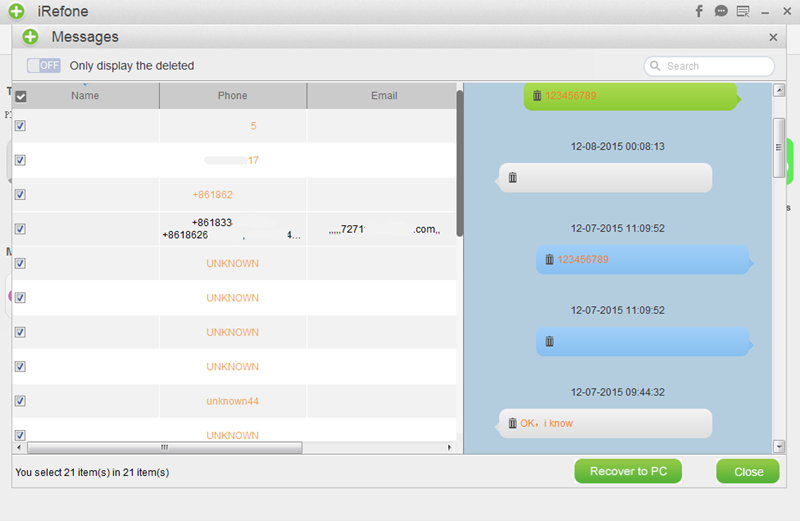 To recover lost/deleted iMessages on iPad, you need iPad iMessages recovery tool, iRefone. 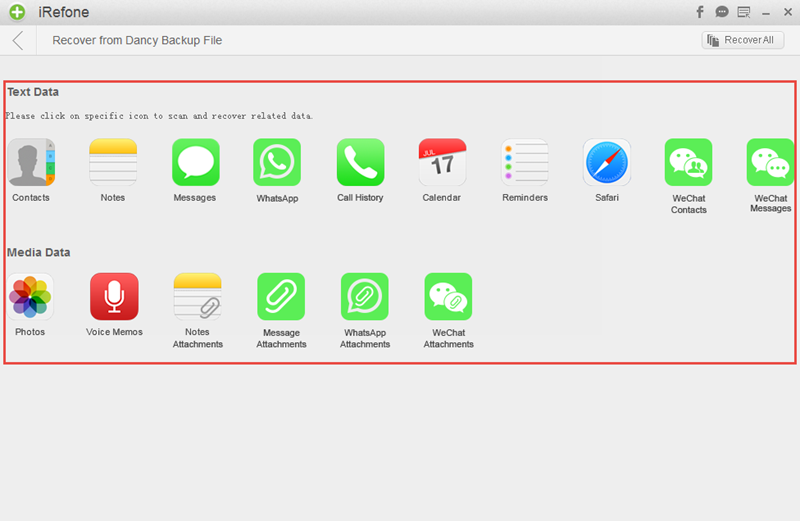 It is designed to recover iMessages from iPhone, iPad and iPod Touch. It provides you 3 ways to recover iMessages on iPad Pro, iPad Air and iPad Mini: recover from iPad directly, restore iMessages from iTunes backup file and retrieve iMessages from iCloud backup. 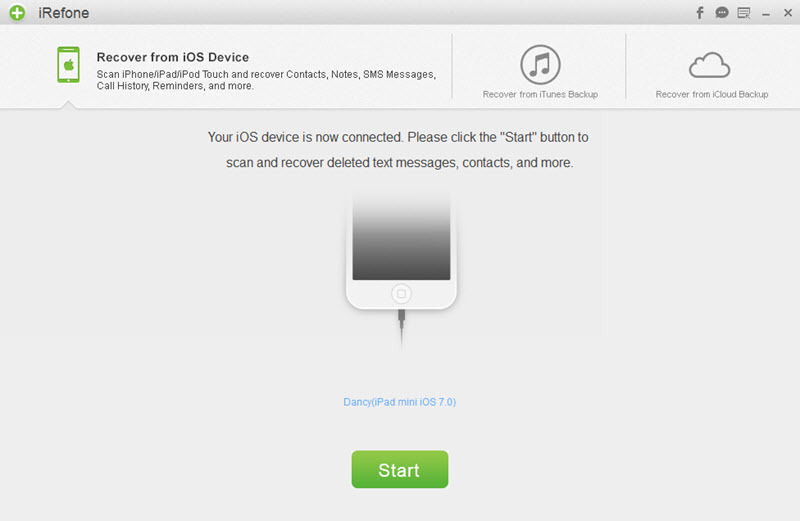 Download and install the software, then follow this tutorial on recovering iPad lost/deleted iMessages. Step 1: Run iRefone and connect iPad with computer. Click on “Start” button. Step 2: Then it will bring you to a interface to ask you choose the data you want to scan. iMessages and Messages are all stored in the category of “Messages”, choose “Messages” icon and the software will automatically scan and analysis your iPad after you click it. Step 3: When the scanning is finished. All of the iMessages of your iPad will be displayed, including these deleted and lost one. Select these iMessages you need and click on “Recover to PC” or “Recover to Device” to save these data on your computer or directly transfer back to iPad. Step 1: Launch iRefone and choose “Recover from iTunes Backup” as the recovery mode. All of the iTunes backup files which you have ever synced with iTunes on this computer will be automatically found and listed in the software. Click “Select” or double click the iPad backup you need to access the data interface. Step 2: Choose “Messages” icon and click the icon to start the scanning. 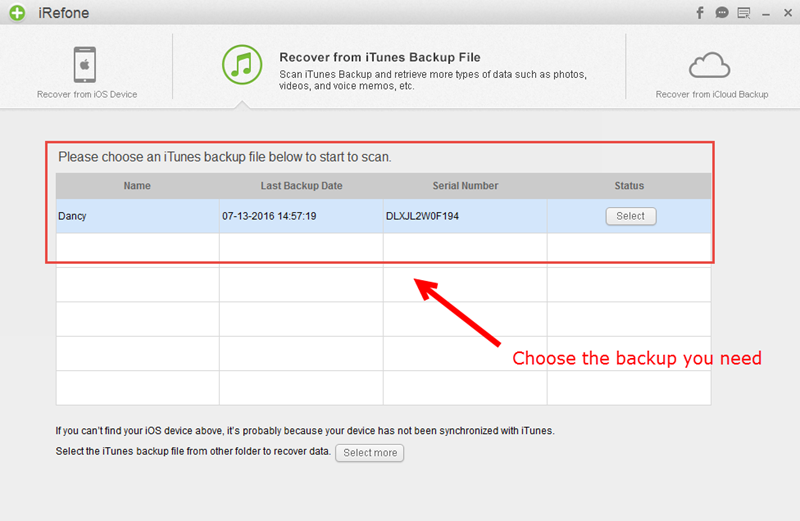 Step 3: When the scanning is finished, preview the data in your iTunes backup and pick out these data you need to save on your computer. Click “Recover to PC” to choose the store folder. 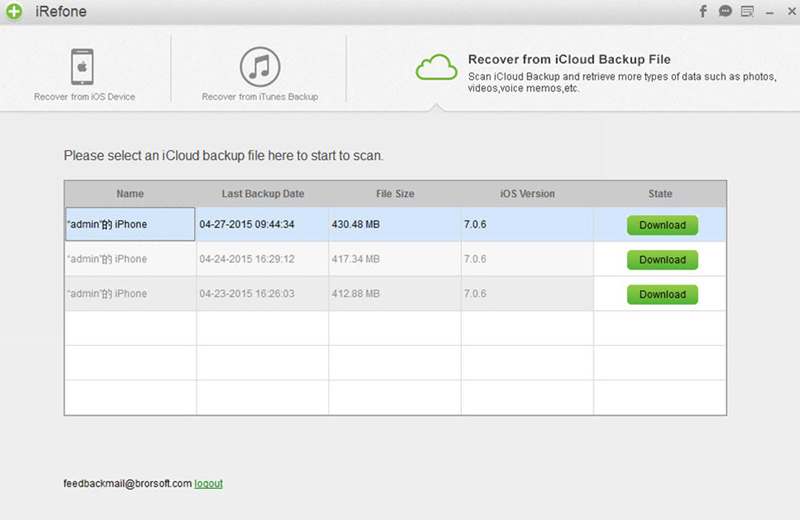 Step 1: Choose “Recover from iCloud Backup” to recover iPad iMessages. Sign in your iCloud account with Apple ID and passcode. Step 2: Choose the data you want to download in your iPad. This process will reduce the time of downloading. The less data you choose, the less time wait for the downloading. Step 3: When the downloading process is stopped, you can click the icon of Messages to start display the chat history of your iPad. Step 4: You could preview all of your iPad iMessages in iCloud backup. Select these data you need to recover them.